If you need to install grab bars in your bathroom, it can be daunting to consider having to drill through tile to install them, so a suction cup grab bar for the shower is the next place to look. 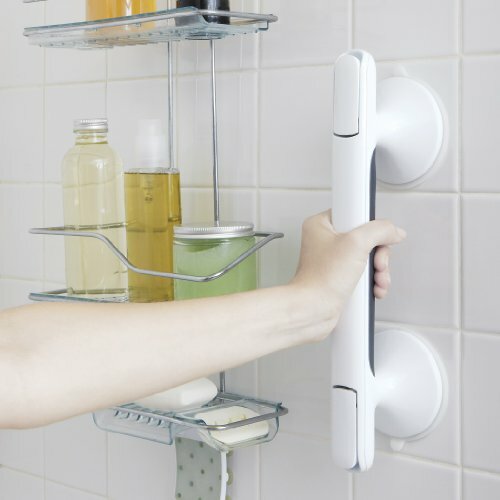 Because a suction grab bar isn’t screwed into the wall, it’s never going to be as solid as the permanently fixed ones, so this is something to keep in mind when making your choice. If you are modifying a bathroom for an elderly or disabled loved one, safety is a top concern so a better long term solution would be to install a permanent bar (preferable stainless steel) using strong wall screws. I recently helped modify my mother’s bathroom, replacing the tub with a walk-in shower. I was tempted to go the simple route with a suction cup model but decided I wasn’t going to trust my mother’s safety (83 yrs old with a recent hip replacement) to a rubber suction cup. So, I bought two grab bars from the local hardware store and decided have the contractors install them since they were putting in the bathroom fixtures and had all their tools out (I’m a fairly handy guy but figured I’d have them do it since they do this stuff all the time and were screwing in other fixtures). When the guy saw the ones I bought from the hardware store, he said they were “ok” but he really suggested I upgrade to these grab bars from Moen. The main reason being according to him- they are made of stainless steel, rated to hold up to 500 pounds and have a limited lifetime warranty. They are also made by Moen-if you’re not familiar with the brand, they are well known for high quality- in the bath & shower world. He also said that he really recommended getting this extra piece of hardware, only because the new curved shower stall did not sit flush to the wall in the spot we wanted to put the grab bars so the screws wouldn’t reach the wall studs. The “Securemount” system (opens PDF with safety test results) is proprietary accessory made by Moen. If you can screw directly into the wall studs you would not really need these (scroll to the bottom if you want to see an instructional video on how to anchor using toggle bolts or screws into wall studs). If you go with another brand you would need to look for some kind of anchor system, toggle bolts or longer screws. (If the screws on only one end of the bar line up with a stud, you’d want to use some kind of anchor there-both ends should be solidly attached for safety). I do understand that there are scenarios where a temporary grab bar can be useful so for our readers we have researched the ones on the market and come up with a short list of decent options. If you need a temporary solution or cannot drill into the wall (rental apartment) then the grab bars with suction cups can be a solution to the problem (even though most landlords with any common sense would allow you to install a permanent grab bar). Actually, if the person in question is disabled, they would most likely be required by law to do so as a “reasonable modification” under the Fair Housing Act. But there are some reasons people do need suction cup style grab bars, so we did want to help you narrow down the choices. Because of the added safety indicators and overall design, we recommend the Grab Bar by Vive as the best pick. If you’re still interested in more details, we have full reviews of this bar along with two other suction cup grab bars below. We’ve also included some tips on things to consider when buying a grab bar for the shower or bathtub and the pros and cons of each of the models we reviewed. The material you wish to attach the handle to – In order to securely attach the suction pads, you will need to place them onto a non-porous material. Tile and plastics are the best choice. You can attach them to natural materials such as marble but they will be less reliable. The size of your tiles – If you intend to attach your safety handle to a tiled surface then you need to make certain that the suction cups do not overlap with the grouting as a complete seal will not be formed. 4-inch tiles can be problematic so you need to be certain to check that the diameter of the suction cup is smaller than the width of the tiles. The size of handle you need – Depending on where you intend to place the handle you will need to consider the size. In the shower a larger handle may be preferable to make it easy to hold. 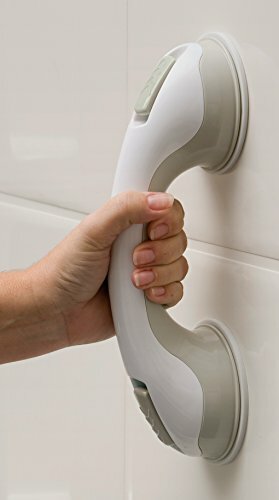 If you are going to use the handle on the bath, then it might be better to use a slimmer handle so that it is less likely to be an obstacle when climbing in and out of the tub. Reliability – As these handles are fitted using suction cups they can and often do fall off. You need to be aware of this fact and find the handle that will give you the best performance for your use. 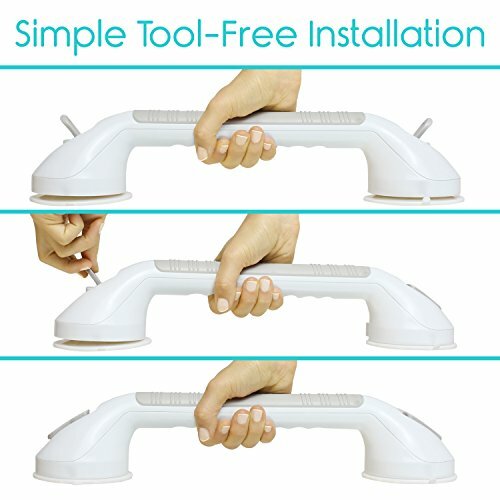 These grab bars by Vive are a good length making them easy to use regardless of the size of your hand size. The design includes an innovative safety feature in the form of red and green indicators. If the indicator is green you can be sure that the seal is secure, if it turns red then you need to adjust them and reapply before use. The size of the suction cups is 3.5 inches, so if you have 4-inch tiles, you may have to be carefully when you apply the suction cups to be certain that you are not applying over the grout as this will not be effective. This safety bar is modestly sized, which means that it does not protrude a large distance into your shower or over the lip of your tub. This is great if you have a tendency to forget about new additions and will save you from bumping into your safety bars. As with many of these safety bars the quality of the seal will depend on the surface to which you apply it. If you have a good flat surface then the seal is very high quality, but if your shower surface is uneven or was wet or dirty when you applied the bar you may find that the bar will become detached over time. The size of the suction cups is such that you will be unable to apply this handle to 4-inch bath and shower tiles, which does mean that for many people you will be unable to apply this handle to your bathroom tiles. This safety bar is more aesthetically pleasing than most of the option out there, and it does benefit of the classic OXO design. The handle is a good size making it easy for most people to grip and the non-slip coating on the handle is effective. 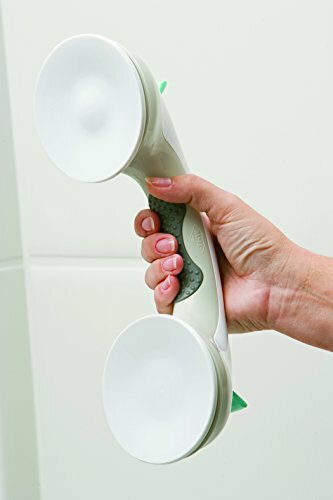 The seal on the suction cups is very strong when it is first applied, but you may find that it is necessary to reapply this handle before each use as the seal can weaken over time. It is easy to attach so this is not a difficult job but it is one you should remember to do. It is possible to attach this handle onto 4-inch tiles, but it will require a bit of trial and error to get the alignment just right. If you do decide to upgrade from a suction cup bar to a permanent bar that’s screwed into the wall, we thought this video was helpful. The green/red safety indicators mean that it is easy to check if the grab bar is safe to use. This can save you from reapplying the safety bar at each use. It is for this reason that the Grab Bar by Vive is the best choice when shower safety is your primary concern. For tips on preventing falls you may want to see this article by the National Council of Aging. If you are preparing a home or residence for elderly or disabled, you’d want to look at a permanent solution that is anchored to the walls like the on by Moen, it’s also important to make sure that the grab bar is fully anchored into the wall with deep screws into the wall studs and/or using a special anchoring device like the one that Moen and similar accessories that other brands offer, depending on which brand of grab bar you end up purchasing.